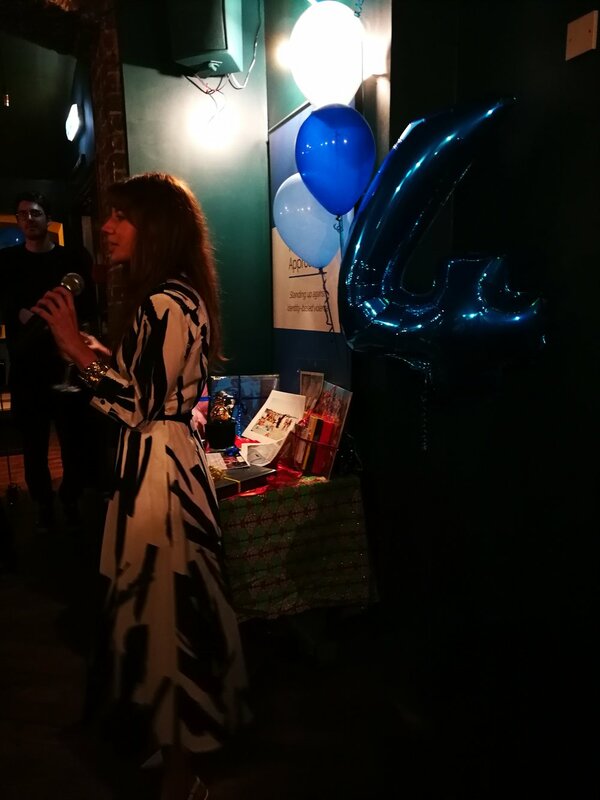 This term Renée (Digital Comms Coordinator) and myself had the opportunity to go to the 4th Birthday Celebrations for Protection Approaches- an influential, growing and frankly brilliant NGO that aims to end Mass Identity Based Violence. The organisation is led by Dr Kate Ferguson and Andy Fearn who since launching it, 4 years ago now, has become one of the leading NGO’s in the third sector. It helps to influence and make foreign policy on Identity Based Violence and Mass Atrocity Crimes, as well as inspire and support an ever growing group of NGOs both big and small, including STAND. We were incredibly excited to represent STAND UK to a room full of like-minded people who were able and willing to dedicate their lives to bettering the role of the UK on the Mass Atrocity Prevention stage. When we arrived, we were greeted with the ever pleasant sight of free wine and an ever filling room full of the brightest minds and influencers in the field of Mass Atrocity Prevention. We were privileged to speak with some amazing people such as Charlotte Melly from Peace Direct, who, with only a small team campaign for peace in 11 different conflict areas at the same time. It was great to catch up with both Laurel Hart from UNA-UK (who had the biggest smile on her face the entire night) as well as Kate Ferguson, who as my lecturer in Human Rights last year, was the person who first introduced me to STAND. We were equally inspired by Andy Fearn who kindly shared with us several ideas to broaden the impact of our Yemen campaign. As it turns out, Andy started his career as the Student Director for AEGIS students (which is now STAND UK), inspiring him to co-found and now co-lead Protection Approaches. After a wonderful evening of cake, wine, good conversation and even better company, Renée and I left in exhausted but in high spirits. Confident that we at STAND were welcome within a pantheon of brilliant, passionate and intelligent individuals committed to making a difference in the world. Volunteering for a student-organisation, within a sector that is constantly confronted with mammoth challenges, at times we may feel powerless in the face of violence and atrocities on a mass scale. Yet, coming together as a community of passionate changers, it is encouraging to know that an ever growing number of people are actively trying to better the UK’s responsibility to prevent mass atrocities.